When You Take the Garbage Out? We clean, sanitize and deodorize your cans. Rid the ICK from your cans! Aqua blaster jet heads scour the inside of each can. My dirty smelly garbage cans quickly went from a sore point of shame to a point of pride. Reasonably priced, arrived on time and did a great job. Highly recommend. This is a really good service. Leaves my bins nice and clean, the best part is that there’s no stinky water or residue left on my street/gutters when it is completed – one of the reasons why I avoid doing this myself. We LOVE the service Canology provides! They come exactly when scheduled and leave the cans looking (and smelling!) like new. Who really wants to clean their own garbage cans? Not me at least. Canology came out and made our cans look and smell brand new again. Highly recommended! Canology BLEW MY MIND! it’s so eco-friendly! They use less water in a year then what I would use in the hours it takes to clean the cans. THE CANS ARE BEAUTIFUL! Our trash cans were nasty inside and out. Canology saved the day! Excellent customer service and the price is right. Canology did an amazing job cleaning our garbage cans. It was easy to sign up, they send a reminder, were on time, and our cans were immaculate! I highly recommend them! Easy to coordinate, awesome service and best yet, the best the cans have ever looked or smelled. Will be using again for sure! …and was very happy with the job they did, but MOST importantly the customer service and follow thru. They called me the day of the service to make sure they had the right cans to clean, as it can be confusing on my home address. They cleaned my cans at my business as well and they all look amazing! 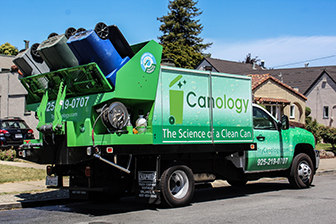 Canology cleans and disinfects trash cans. I have cleaned the cans myself, and it takes a lot of water and time, and I still couldn’t get them completely clean. My cans are several years old, and after this service, they look and smell like new! Our trash cans are so clean now they look like new. It is so easy to book a service. Amazing team, wonderful customer service, and user-friendly website. Canology is the BEST!!! We are delighted with the GREAT job done on our trash cans. Our greens bin was the worst – embarrassingly smelly and gross! Now its interior actually shines!!! What a wonderful service! I highly recommend it! I was very Impressed!!! We use our green waste bin for food scraps and it was disgusting and foul smelling. I decided to have all three cans cleaned to see how good the service was. WOW, they looked brand new, the inside/outside were cleaned and they were deodorized. I was shocked at how clean they got them! I highly recommend Canology, sign up and give it a try, you won’t be disappointed. My garbage, recycling, and yard waste cans were looking and smelling something terrible. Canology cleaned and deodorized them last week. They did an amazing job! I will definitely use them again in the future. My trash cans look like they’re brand new! They were disgusting and I had been putting off cleaning them because it is such a huge, filthy job. I left for the day and returned to sparkling cans. I never could have gotten them this clean. I will definitely use their service again. I was amazed to know a service like this existed! I am so glad now my trash cans will not smell anymore. I am very impressed and enjoyed looking at the process too! Dirty trash cans are more than foul smelling. They are a breeding ground for germs, mold, ants, & flies. 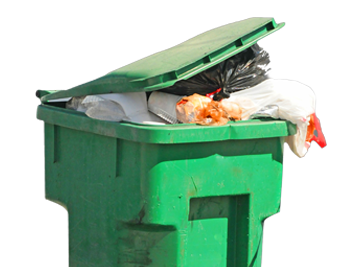 We come to your curbside and leave your trash cans clean, sanitized and smelling fresh. 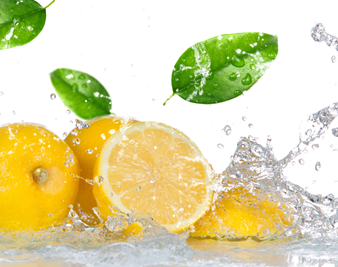 We utilize an eco-friendly cleaning process, using a minimum amount of water, to clean and sanitize your cans. We will rid your cans of obnoxious odors, germs, bacteria and rotting waste. Our state of the art green eco-friendly wash truck lift your cans over the wash bay, where the Aqua Blaster jet heads scour the inside of each can with extremely high pressure hot water that rids the ick from your cans. We finish the cleaning process by hand detailing every can inside and out and applying an eco-friendly sanitizer and deodorizer that leaves your can looking and smelling like new. 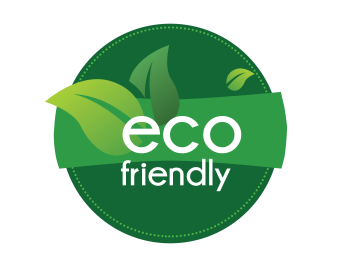 Affordable, eco-friendly service – Let us take charge of your cans, we have it down to a science!